That is kind of a tricky statement because I don’t think it means what you think it means. 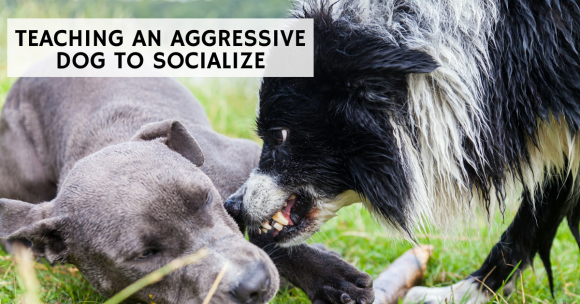 When people speak of socializing an aggressive dog, they often mean turning it loose with other dogs, or that is their goal. Many people tell me that they take their dog aggressive dog to the dog park so that he can learn to get along with all dogs. I want my aggressive dog, or my client’s aggressive dog, to simply learn to coexist with his trigger in the environment without any aggressive display. My current Malinois doesn’t like people, and he doesn’t really like other dogs, but you can’t that tell by looking at him. I have taught him “coping mechanisms” around things he doesn’t like. He doesn’t need to go into an aggressive display. I recognize when he is uncomfortable, and I relieve his stress by giving him something to do and think about. He also trusts me not to stress him out. For instance, I wouldn’t toss him in a dog park and expect him to socialize, and I don’t force him to allow people to pet him. If I did those things, I would have a dog who couldn’t trust me. Then his only coping mechanism would be aggression and using his teeth. After all, he can’t talk and tell me, or others, how he is feeling. I must get familiar with his body language and levels of stress, and work together to decrease them, not make them worse. So, stop forcing your dog to do things he doesn’t want to do when it comes to socialization. If he is growling, snarling, hackling, lunging, and trying to get away, trust what he is trying to tell you; HE IS UNCOMFORTABLE! I’m thinking, “EGADS! !” Why is he meeting them if those are the behaviors you are describing? This is how people and other dogs get bitten. Just because he hasn’t attacked a person or another dog yet, doesn’t mean that he won’t! He needs to trust you not to expose him or force him into bad situations. Without trust, you won’t have successful training, because he feels like he has to defend himself and take care of himself. I mean, you wouldn’t be able to accomplish a task if you were in a situation and you were afraid something bad would happen to you, and you didn’t trust the person you were with to take care of you. In other words, I am going to drive you to the bad part of town and give you a math test to take. My brother is a police officer so I wouldn’t have any trouble doing this task if he was with me. I wouldn’t, however, be able to do this if I was with the coworker that doesn’t like me. It is crucial that your dog trusts you. If you want him to ignore the “danger” he perceives, and perform obedience tasks, he has to trust that you can take care of him and you! And, the reward for successfully functioning around his trigger must be greater than the distraction itself! I will also want a hungry dog! If I am going to work on something as important as changing aggressive feelings, I am going to want to ensure that my dog is hungry. A hungry dog is a motivated dog! Then the rewards that I use are more meaningful. If I took you to the buffet and let you eat till you were full, offering you a candy bar to pick up a snake or let a spider crawl on you probably wouldn’t be effective. If you were hungry and had missed a meal or two, you would probably be more motivated! Now it is your job to teach your dog how to function around his trigger. He doesn’t have to be “petted” by people if he doesn’t like people. He merely has to be able to be around them without an aggressive display. He doesn’t have to “play” at the dog park or with other dogs. He merely has to be able to walk past other dogs without losing his cool. 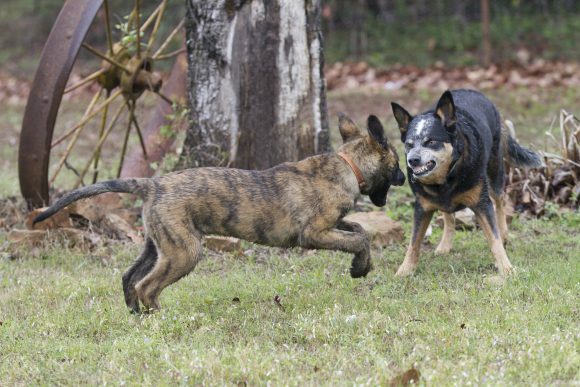 Once you know what your dog needs, being able to trust you and being motivated to listen to you, you will be able to work on his aggression and socialization!